Danny starts off the convo asking if anyone doesn’t know about the PageRank sculpting debate that grew out of SMX Advanced earlier this year. No one raises their hand and Danny’s glad to know it. Eric Enge is our first speaker and will introduce the topic. Implementing the nofollow attribute requires a simple syntax and stops the flow of PageRank to the page being linked to. PageRank sculpting died because of spammy comments. PageRank sculpting used the nofollow attribute to stop link juice being flowed to certain pages and to redistribute the link juice to the other links on the page. At SMX Advanced Matt Cutts of Google explained that rather than redistributing PageRank, the nofollow attribute would evaporate PageRank. If you need more background, check out >Matt Cutts on Nofollowr and the Siloing Solution. In one instance, a business redesigned their product menu and nofollowed 75 percent of the links. What happened is there was a huge downward spiral of indexed pages. So, when they took down the new product menu, their growth curve has been restored and their indexed pages came back up. The implementation of nofollow had a clear cut on-and-off effect. Leslie Rohde steps to the podium and asks why we keep revisiting this topic. He thinks that there might be a conspiracy… Google went from saying it’s okay to recommending against it. He wants to know if F.U.D. is a profit making center for Google. Or, maybe SEOs are winning here because companies find they need lots of help to figure out the PageRank sculpting issue. Does sculpting work? For what purpose? Do you have enough clay to sculpt? Sculpting is optimization by subtraction. An alternative is optimization by addition — adding content. Leslie squeezed lots of slides into 7 minutes — which means I missed a lot and now he’s out of time. Brent Payne is next. Here’s the scenario. At the Tribune Co., they created a tool that allowed producers to assign a value to every page created on the site, level 1-5. The highest level pages would be stripped of follow links. It worked well and they found they could easily rank for breaking news stories. But as the first of this year came around, he feels like something had changed. It could have been a number of things that they don’t know about, but something was different. After Matt Cutts announced the change of nofollow behavior, their approach changed as well. Followed links on breaking news pages are reduced by removing the links in full. The new tool is still new and saw its first major implementation during Chicago’s Olympic bid loss, but in that case it seems to have worked extremely well. Adam Audette will discuss the e-commerce perspective and how nofollow sculpting as always sucked in his opinion. Primarily, it was never standardized across engines, and it was mostly all about Google. He’d never seen much evidence that it worked, either. When Google came out and said it didn’t work anymore, the reason to use nofollow sculpting was even more uncertain. Instead of sculpting, work the site architecture, internal linking, and work the global and sub-navigations. Use your content, landing pages and internal linking to your PageRank advantage. With testing they identify the topics that users care most about and emphasize them across the site. At Zappos they aren’t doing any sculpting and they did $1 billion in sales last year. 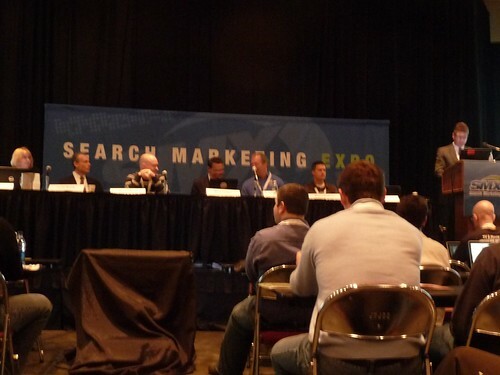 Next, Rand says that there’s lots that we do in the SEO world that we do just for engines. Since we can’t use nofollow anymore, SEOs are trying new and old methods of PageRank consolidation. He believes PageRank sculpting is useful for solving one issue: move your page from not indexed to a strong and steady position in the index. Google crawls roughly in decreasing order of PageRank. Yahoo! and Bing said they treat nofollow in much the same way as Google does now, but without the evaporation. The engines have also implied that the number of pages indexed from a site is proportional to that site’s importance and popularity on the link graph. He’s calculated that about 3 percent of links use nofollow and that 3/4 of the time it’s used on internal links. Shari Thurow steps up to the podium as the last speaker. She says she has a different opinion than most SEOs. She sees nofollow as a band-aid. As a specialist in search-friendly design and information architecture, she likes to have control over a site’s architecture early in the SEO process. A mental model is an explanation of someone’s thought process. SEOs and searchers have different mental models of what the user wants and how they interact with a Web site. The closer the represented model comes to a searcher’s mental model, your brand and credibility will as well. EDITOR’S NOTE: Siloing can be an effective search engine optimization technique if implemented correctly. See our online SEO Tutorial for up-to-date specific guidelines on how to silo a website. Hey Rand, Do You Mean Siloing? What Is Google PageRank, How Is It Earned & Does It Still Matter? Doesn’t sound like much as changed since Google made the announcement about the non-value of internal nofollow. Best practice continues to look like sculpting via use or non-use of your internal links – ignoring the nofollow tag altogether. Will continue following the live blogging – thx to you all for posting!